From Takara Tomy Website. 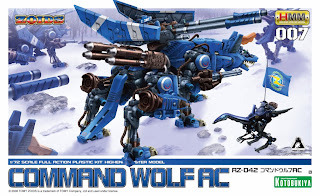 This is the sixth kit under the Zoid Graphics Series, Guysack. It includes the kit, the diorama base sprue and the magazine and will cost 1890 yen. Here are some update pics of some of the new kits that will be release under the Rebirth Century Line. It seems that this one is a re-tooled garantulon. Also it has a set of customize parts. This is a new version of the barigator. Said to be motorized. And lastly, this new type of design that really interest me. The color scheme is very nice and the details are great. From Takara Tomy Website. This is the third kit under the Zoid Graphics Series, Malder. It includes the kit, the diorama base sprue and the magazine and will cost 1890 yen. This beauty is now being sold at Yahoo Japan for as low as 1,500 yen starting bid to a high of 4,000 yen. From Takara Tomy Website. This is the second kit under the Zoid Graphics Series, Helcat. It includes the kit, the diorama base sprue and the magazine and will cost 1890 yen. From Takara Tomy Website. This is the first kit under the Zoid Graphics Series, Godos. It includes the kit, the diorama base sprue and the magazine and will cost 1890 yen. Latest pics of the two HMM Molgas from Kotobukiya. Found these zoids gashas at Yahoo Japan. Base on the pictures, there are two zoids in one package. These gashas are sold for 1000 yen each set. The packaging features the Saber Tiger.